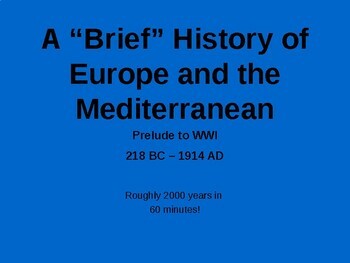 This PowerPoint is designed to help you give a "brief" history of Europe and the Mediterranean in order to help students understand the history leading up to WWI. 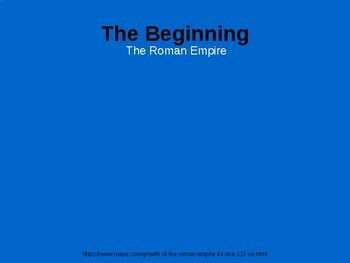 This PowerPoint is intended to center on the Balkans (mind you in a round about way) to show how the conflict in the Balkans has been brewing since the time of the Romans. 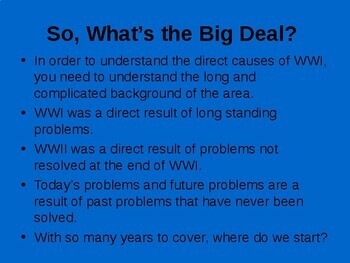 I used this PowerPoint to introduce the start of WWI by showing students why Serbia and the Austro-Hungarian Empire had conflict and why the region was volatile for such a long time. I have included maps and some details about the Roman, Byzantine, Ottoman, and Austro-Hungarian empires; however, you can adjust it to fit your needs, either by adding more slides (there are 18) or adding more details as you see fit. 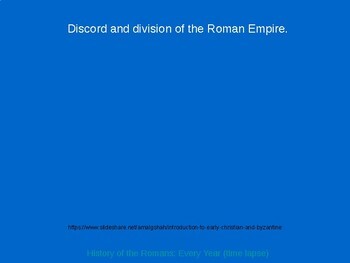 I have also imbedded a hyperlink to a time-lapse video of the rise and fall of the Roman Empire in case you would rather use that instead (the video is just linked in the presentation and it is not my creation).